"Just to record my thanks to you and your staff for a fine effort in replacing the hood on the above vehicle which enabled us to deliver to the customer in Scotland (on time). Well Done!" "I am attaching a couple of photos of my motorcycle seat which you very professionally lowered for me. Since lowering the seat I have done a fair distance on the bike and can report that it is not only much more comfortable, but I can now reach the ground a lot more easily. 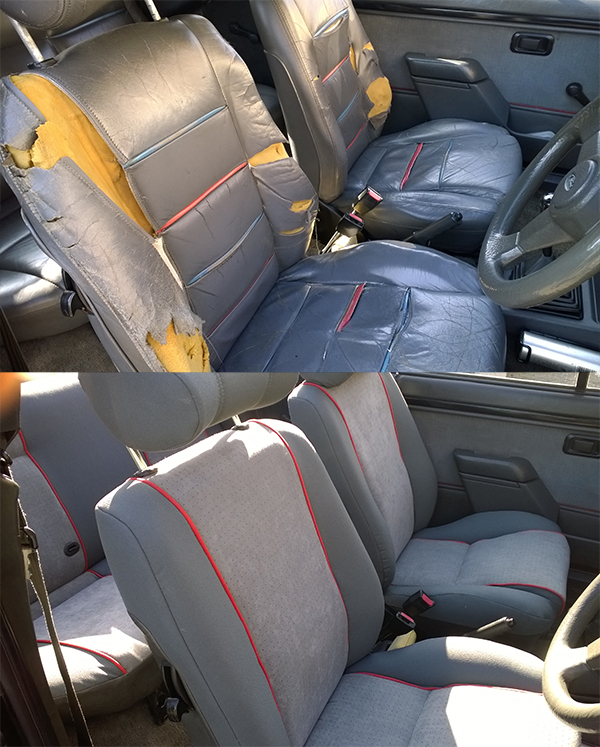 The grey piping as a finishing touch was a great idea and really sets the seat off - very many thanks for your prompt and expert service - I will certainly be using your services in the future and am happy to recommend you to others." "Thanks for super service, hood looks great." "In my opinion your company is second to none, I have and will still continue to recommend your company. Thanking you again for all the support that you gave to me when I was an engineer because this removed a great weight from my mind knowing that your company would provide a first class service to the customer." "Hello, I came round on the Thursday for Ms J to fix my bike seat. Having covered a few hundred miles since, I want to say that in 35 years of biking, this was the best £75 I ever spent. Ms J delivered a top piece of craftsmanship, which regrettably is increasingly rare these days." "Can I just say what a fantastic job you did. Not only do I now have a rear window without a hole, I have a nice clean car (thanks to whoever hoovered it) and also it doesn't leak around the roof seal / window anymore. Would highly recommend your company to one and all. Thank you very much." "Steve – just a note to say how impressed I am by your customer service – (sadly) it is atypical in the UK! I will have no hesitation in recommending your firm." "Just a quick note to say a very big 'Thank You' for the fantastic job your team did on replacing our roof. Not only was the job done neatly and professionally, but you and your team gave top drawer customer care. From our dealings with you on the phone and especially your excellent delivery driver, the service was 100%...something sadly lacking in the majority of today's companies." "Dear Steve, Just want to thank you SO much for such a great job. (And the man who delivered it back was really helpful.) I used the car today, and it was - pure pleasure! The roof positively glided up and down. As if it were new. And it shut properly for the first time in years. So Steve thank you again for a wonderful job. As you can tell, I'm thrilled." "I have just taken delivery of my much missed MR2, who looks fab with a new roof. The chap who delivered it was extremely nice and very helpful answering all questions fired at him taking time to make sure I was at ease with putting the roof up and down, please pass on my thanks." "Excellent service throughout, thank you." "Many thanks for the wonderful service you gave me and my car (roof). I just felt I had to thank you in writing as I feel it was such excellent service." "Just to thank you and your staff for a superb job done on replacing the soft top on my TT - very pleased with it and with the prompt service. " "May I also take this opportunity to commend you on your excellent 'after sales' service - very reassuring - and the advice on care and maintenance has been invaluable." "The blue roof looks great and we really appreciate your efficient and friendly service - it makes a change from Audi!" "I am really impressed with the new back window and the service your company provided, and would certainly recommend you to anyone requiring similar work."